I made this card fro Janis. Waffle Flower Dream Cat stamp. 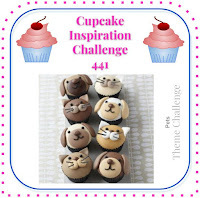 Craftstamper Take it make it challenge 28.03. Simon says wednesday challenge 14.03. So cute, Fiki! I love the adorable floral kitty! A cute card Fiki, so sweet. This card is gorgeous. Love that image. Lovely card, beautiful colors and I loved your background. Thank you so much for joining us at Cupcake Inspirations. Sending love, Ishani. As soon as I saw this card I knew that cat was by Waffle Flower. I saw their booth last weekend at a convention. They had some very sweet stamps. I didn't get any though. super cute card! I am so glad you played along with us at simon says stamp wednesday challenge!